Conan had sprung back, wheeling to face the door at the same instant, lips asnarl. His barbarian ears had caught the quick tread of soft slippers outside the door. The next instant the door was thrown open and a slim, silk-robed form entered hastily, pulling the door shut—then stopping short at sight of the hillman. Chunder Shan sprang up, his heart jumping into his mouth. 'Devi!' he cried involuntarily, losing his head momentarily in his fright. 'Devi!' It was like an explosive echo from the hillman's lips. Chunder Shan saw recognition and intent flame up in the fierce blue eyes. A Howard collection...one volume from 1977. I incorrectly referred to these '77 books as novels. They are one volume Narratives. But still good if you can find them. Fantasy at its male dominated best. Conan the quintessential Barbarian Thief. I was thoroughly impressed by these stories from the 1930's pulps by Robert E. Howard, "father of the sword and sorcery genre." I'd argue that they're also (very effective) horror stories. Howard's command of language is magnificent. Sword and sorcery with a large dash of horror, very dark. Pulpy, but wonderfully entertaining. You can't go wrong with Conan, especially written by Robert E. Howard himself. Plus it has this great color foldout poster. 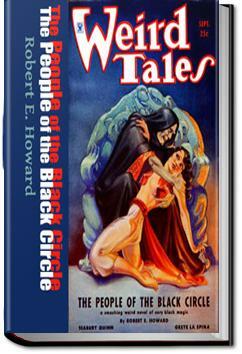 This edition of People of the Black Circle came with a Frank Frazzetta poster on the inside cover. I believe it is still there on my edition I bought back when. My date on reading this is just an estimation. I had read the story before that and after that as well.